Pollution kills three times more people than AIDS, TB and malaria, combined. We are exposed to it every day, and it is silently killing us. Cycling to work, I breathe the fumes from the cars surrounding me. Drinking from my tap, I am consuming microplastics. Eating my food, I am likely exposed to trace chemicals used in its production. Pollution is pervasive, and we have come to accept it as a by-product of industrialization. It’s time to wake up to its negative impacts on our health and economy. 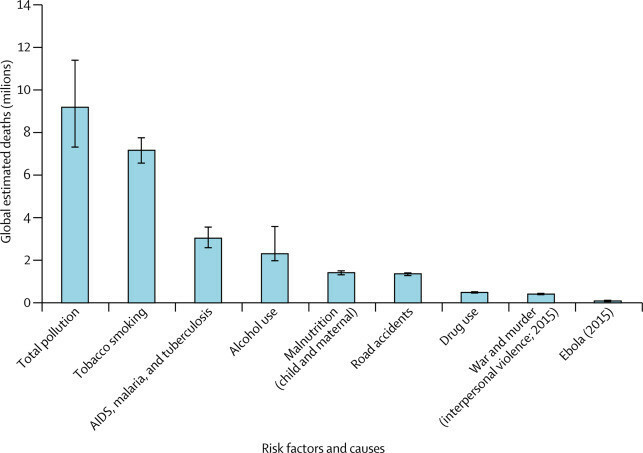 Last week, the Lancet Commission on pollution and health launched a seminal report that named pollution as the largest environmental cause of disease and premature death in the world today. It states that diseases caused by pollution were responsible for an estimated nine million premature deaths in 2015—16% of all deaths worldwide. This is three times more deaths than from AIDS, tuberculosis, and malaria combined. It is 15 times more than from all wars and other forms of violence. Furthermore, the welfare losses due to pollution have been estimated at more than US$4.6 trillion per year, which is equivalent to 6.2% of global economic output. The poorest countries suffer the most, with 92% of all pollution-related deaths happening in low- and middle-income countries. Children and the elderly are hit the hardest. These numbers are staggering. So what can we do to act? Design is critical for preventing pollution in the first place. This is about the materials that go into the products we use, the fuels that power our homes and vehicles, the nutrients that help our food grow. Decisions that happen in the design phase will at some point impact every one of us, though perhaps not visibly. Designing in congruence with nature can prevent pollution. It is possible in every sector. Consider the Balbo Group, Brazil’s largest organic sugarcane grower. It has revitalised ecosystems, achieved higher yields, and created an industrial farming model that functions as well as nature itself. Or consider Fairphone. Though currently small-scale, it is an example of designing to eliminate waste and toxicity upstream, while enabling modularity for a longer product life and easier repair. These approaches have proven both possible and profitable. The places that suffer most from the effects of pollution are also those which lack the infrastructure and legal frameworks to manage it. Investment in pollution control measures is critical and provides a positive return. In the US, every dollar invested in control of ambient air pollution since 1970 has not only improved health, but is also estimated to yield US$30 in economic benefits, according to the Lancet report. This represents an aggregate benefit of $1.5 trillion against an investment of $65 billion. Resources to support the introduction of pollution control measures, in particular in developing and middle-income countries, will pay off. Protection from the unknown impacts of pollution through smart regulation remains critical. Rachel Carson’s Silent Spring in 1962 was a stark warning about the health and environmental dangers of DDT, a powerful pesticide that became pervasive after WWII. It was shown to enter the food chain and accumulate in the fatty tissues of animals, including human beings, and cause cancer and genetic damage. This helped spur the environmental movement of the 1970s and introduce important regulations. The Lancet report highlights that since the 1950s, some 140,000 new chemicals and pesticides have been synthesized. Of the 5,000 produced in the greatest volume, fewer than half of these have undergone testing for safety or toxicity. It notes that rigorous pre-market evaluation of new chemicals has become mandatory in only the past decade and in only a few high-income countries. This should concern us. Precautionary approaches are required to monitor and understand better the impacts of chemicals and pesticides before they enter our food, water and air. Partnership across government agencies and the private sector will be critical to help scale and accelerate the development of clean technologies which prevent pollution at its source. The success of the renewable energy sector is a positive case in point. Strong government policy and commitment to a renewable energy transition has helped to drive technology innovation and rapidly decrease cost. As a result, electricity from photovoltaic panels today costs almost a quarter of what it did in 2009. It is cost competitive in many markets, and cheaper than conventional electricity sources in some. Analysts project that even in places like China and India, which are rapidly installing coal plants, solar will start providing cheaper electricity as soon as the early 2020s. Collaboration can also help quickly deploy clean-up efforts. The Montreal Protocol on substances that deplete the ozone layer, signed 30 years ago, serves as a positive example of government and business coming together to phase out chemicals known to delete the ozone layer. The Protocol now has 197 countries participating. It has resulted in the phase-out of 99% of nearly 100 ozone-depleting chemicals. This approach can be replicated. Each of us take decisions on a daily basis. We can drive or cycle to work. We can carry a reusable coffee mug or throw away a plastic equivalent every morning. We can ask questions about the food we buy or the clothes we purchase. While these actions may seem trivial at an individual level, at a collective level they will have a huge impact. They will grow the market for cleaner products and decrease demand for things that we know cause pollution. These personal decisions are critical and will have an impact at scale. In December 2017, the United Nations Environment Assembly will bring together environment ministers and stakeholders from around the world to discuss global solutions to land, water, marine, and air pollution. This will be an important meeting of leaders, but every one of us can also act to #beatpollution.